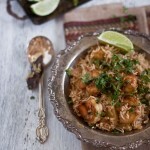 A one-pot rice meal made with shrimp, rice and a whole lot of delicious Indian spice. 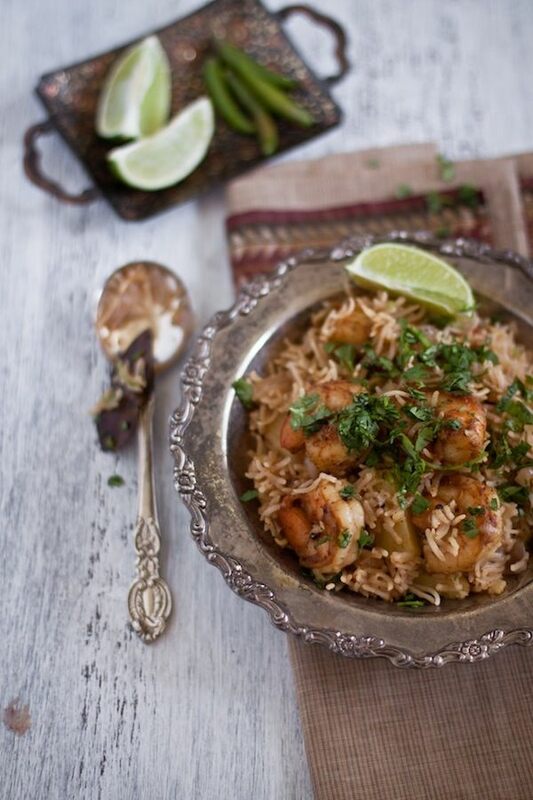 Put the clean shrimp in a mixing bowl, season with some salt, add 1 teaspoon garam masala powder and let it marinate for about 15 minutes. Wash the rice and soak it in water for about 15 minutes. Use a deep saucepan that has a tight fitting lid and heat 1 teaspoon ghee in medium heat. Add cinnamon stick, star anise, cardamom and bay leaves. Let it infuse the ghee for about a minute. Now, add the marinated shrimp to the pan and sauté for about 5 minutes. Take it out from the pan and keep it aside to be used later. In the same pan, pour 1 more teaspoon of ghee and add ginger, garlic and sauté them. After about a minute, add the onions and cook until they’re golden brown in color. Then, add the potatoes, season with salt and cook for about 2 minutes. Add the tomatoes, 1 teaspoon garam masala powder, chili powder and sauté for about 2 more minutes. Drain the rice, add it to the pan and give it a stir. Season it with salt, add the chopped mint and sauté for couple more minutes. Next, add water, give it a mix and bring the heat to high. Once the water starts boiling, bring the heat down to medium and let it simmer until the water is almost absorbed. This should take about 15 minutes. Add the sautéed shrimp to the pan, lightly mix it with the rice, stop the heat and cover the pan with the lid. After about 10 minutes, fluff the rice using a fork. Add chopped cilantro and serve it warm with some cold yogurt or salad on the side. Dried nuts like cashew or almonds would works as a great garnish on this simple meal. You can make this in advance, and re-heat it in the microwave for couple of seconds before serving. Ghee is made from dairy, but all lactose and casein is removed in the clarification process. Use your personal judgement when opting for a dairy-free diet. If you’ve chosen to omit, use replacements such as coconut oil, or vegan butter. To make a vegetarian version of the pulav, you can add vegetables like cauliflowers, carrots, broccoli, paneer (Indian Cottage cheese), or peas. Basically any vegetables that would give a slight crunchy bite in every spoonful of the flavored rice are fair game!